Nihonshu—sake clear as water—is characterised by its softness and the very complex aromas it releases. Pen PARIS met up with the parties involved in upholding the quality and reputation of nihonshu, to gain a better understanding of the many facets of this millennium-old beverage. A rice paddy for the Aramasa sake brewery in Akita Prefecture. When ready for harvesting, the stalks sag under the weight of the very ripe grains. 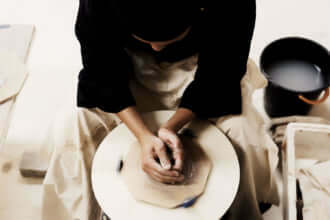 How will the ancestral nihonshu tradition endure? Through the enthusiasts, who are always ready to face new challenges, without ever denying the lessons learned from the past. In Japan, there are currently more than 26,000 trading companies over a hundred years old. More than seven hundreds of these are specialist sake producers. These figures are nothing to be amazed about, for this national drink has a history going back 2,000 years. Sake-making started around the same time rice was first grown and has followed the same method since the beginning of the seventeenth century, always under the benevolent gaze of the Japanese gods, who have contributed to the establishment of a flourishing industry. Still, this industry has met with its share of surprises in the last fifty years. For example, in the 1960s, while Japan’s economy was growing from strength to strength, local interest in sake had instead had begun to decline. Perhaps consumers were increasingly drawn away by western alcohols, such as wine or whiskey but the crux of the problem lay in the deteriorating quality of nihonshu. Counterfeit sake had flooded the market, using aromatics instead of rice. They were cheaper and designed to inebriate—even sake containing an incredible amount of fermented alcohol, a development that followed recurring shortages of rice during the war. These, however, were merely pale copies of nihonshu. Sake, therefore, had become branded as an ‘alcohol fit only for inducing a hangover’, considered by the Japanese as the ‘perfect forfeit for losers of games between friends’. Of course, this was not the only phase of prosperity and crisis the sake industry had experienced and survived, but time forbids us from enumerating these in detail. The conditions for making sake change with the times—even over the last five years. The polishing process, which is removing a percentage of the grain husk, bestows coveted aromas and flavors upon the sake—higher polishing ratios yield stronger less desired aromas and flavors while lower polishing ratios bear a more refined sake. Until recently, even sake with low polishing ratios had been considered high quality. However, today the polishing ratio alone isn’t an indicator of quality sake; what matters now is refined taste produced without abandoning the traditional process. Nestled in Tohoku’s Akita prefecture, Aramasa brewery leads the pack in new sake trends. Its longstanding reputation as one of the top breweries arose from what is known as Yeast No. 6, which they use in their vats. The Brewing 6 of Japan cultivates most yeasts used throughout the country, numbering them as they are discovered then certified by the society. The society has a strict process and only certifies the best quality yeasts. The sixth to be recognised appeared in Aramasa brewery in 1930. Yeasts one through five are no longer used in sake, so No 6 is the oldest in Japan. 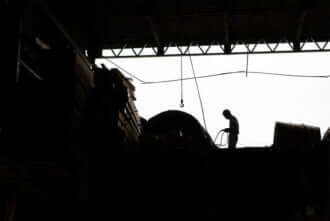 Steaming is the most important step in making sake. The rice is cooked in a few seconds in superheated steam. The Ginjo warehouse, built a hundred sixty years ago, where yeast No 6 first made its appearance. Junmai and Honjozo represent a historical jump to premium sake that pairs well with food and proffers a handcrafted finish and palate. 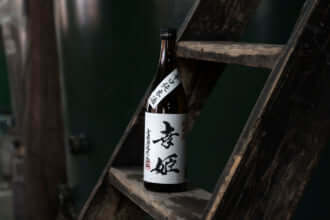 When Yusuke Sato, the eighth head of the Aramasa sake brewery, took his position, he chose to brew only the alcohol fortified Junmai. Many thought this was a bold move, and that it would cost the brewery their competitive edge. Honjozo is less expensive than Junmai for both the distributor and the brewer because of its longer shelf life. Sato, however, was confident that it was the right choice, and he went to work exploring the right balance of flavor to charm customers while maintaining the integrity of the craft. To achieve his lofty goal, Sato simplified the brewing process: Fermenting without shredded yeast, although it cost him weeks for each batch and left the batches vulnerable to bacteria and wild yeast contamination. Lactic acid halts contamination, so many breweries use artificially refined acids to offset the number of microorganisms and improve fermentation time. However, Sato took a more natural approach adopting the kimoto-zukuri method, adding lactic acid producing bacteria cultures. The process takes extra time and demands more control and painstaking attention, but it yields a final product that offers deep yet delicate aromas, a finely-balanced palate, and most of all, a pure and elegant sake. Only 10% of Japan’s breweries use the kimoto-zukuri method. The risks are high, and the yield is low. Sato’s quest for a superior sake led him to eliminate additives from the process such as fermentation catalysts, exogenic enzymes, and minerals that didn’t often appear on the labels. While others were using vats that offered easier control of contaminants, Sato insisted on wooden fermentation vats despite their numerous difficulties. The world’s interest in the Aramasa brewery lies in its ability to embrace new challenges while preserving traditional techniques. Molds and microorganisms, called koji, are integral to making sake for fermentation. There is a variety of koji, and brewers add it to the rice. The most common one is yellow. Aramasa is now experimenting with replacing the yellow with the white yeast used in shochu production. Encouraged by the innovative spirit of its workforce, the brewery is attempting to develop a technique for procuring koji from unprocessed rice rather than steamed rice. It is, therefore, amazing that the brand enjoys an image of excellence, which earned it a Gold Prize in 2014 from the National Research Institute of Brewing. Aramasa contributes a great deal toward this trend of innovation, even considering sake with extremely low polishing ratios as being of superior quality. ‘The rice is polished by a machine and therefore does not require staff to devote time to it. Conversely, the use of wooden vats that need to be laboriously maintained, and the application of the kimoto-zukuri method, which requires the staff’s unflinching attention, means extra costs are involved’, explains Mr Sato. And for the sake lover, it is not a percentage but the taste of the sake that is important. Most sakes have been primed to have a sweet taste from character-setting yeasts, where the red hues and pronounced aroma are reminiscent of other sakes and leave no room for a surprise on the palate. However, whether whiskey or wine, their most appealing feature has always been how one can discover the personalities within the drink. Finally, Aramasa is also planning to grow its own rice. Their objective is to create a farming company that can manage at least 110 hectares of rice paddies within some ten years. ‘Unlike other crops, rice can be grown without damaging fields by over-farming. This is why the same ground can be cultivated for several thousand years’, explains Mr Sato. There is no doubt that the Aramasa brewery—constantly cutting out a path between tradition and innovation, past and present—stands as a perfect example of the new breweries of our modern age. Shredder in which the yeasts multiply to provide the base for nihonshu. It consists of water, steamed rice, koji mold, and yeasts. Clean, large vats. It is the bacteria in these vats that determine the personality of the sake. The steamed rice is rapidly cooled down. The cellar becomes filled with the rich aroma. Modern labels which, at first glance, do not bring to mind those of traditional nihonshu. The figure 6, of course, refers to Yeast No. 6. A graduate of the Department of English Language in the Faculty of Letters at the University of Tokyo, Yusuke Sato was destined for a career as a journalist. At the age of 31, driven by his passion for nihonshu, he joined the Aramasa brewery, which he has now headed since 2012, as its eighth head.